Vancouver overcame my expectations, and EC Vancouver too. On my first day, I met about 20 people from different countries, and at the beginning for most of us there was a language barrier, but as soon as we started the classes, (I was in an intensive English course – 30 hours per week) and felt comfortable with the language, we started to make friends, share experiences and know the city. No matter the ages, nationalities or how long they were going to be here. The methodology of teaching in EC Vancouver is completely different comparing with regular English classes, because you are able to move up your level periodically, there are focus classes where you can meet many people, and they are designed to work on special skills such as speaking or writing. In addition, the teachers are very friendly, and most of them have an amazing humor. The EC staff is very kind too, they are always willing to help and even some of them have become friends. Therefore, the classes and the experience there are fun. I am sure that I will not forget my experience in Vancouver. Most weekends I had something to do in the city or close to it. Furthermore, there are a lot of natural parks, mountains for skiing, museums, etc… All the same, the season when you choose to come is really important. I was there part of the winter, the spring and the beginning of summer. I could appreciate how the city changes, how the trees bloom, even the clothes that the people wear. In fact, I made a list with the important places to visit. I was improving my English at the same time as I was making memories. Planning to come to Canada to improve your English skills? 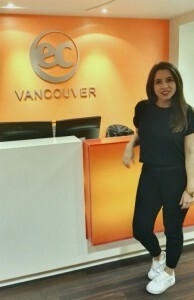 Check out EC English Language School in Vancouver!